This brightly-coloured frog lays its eggs on the ground and must climb high into the rainforest canopy to transport its young to a watery nursery. How? Poison arrow frogs have poisonous skin, which stops other animals eating them. Poison arrow frog lays their eggs in water. The male poison arrow frog carries its tadpoles into the rainforest canopy and deposits them onto a bromeliad plant. The female poison arrow frog lays unfertilised eggs for the tadpoles to eat. 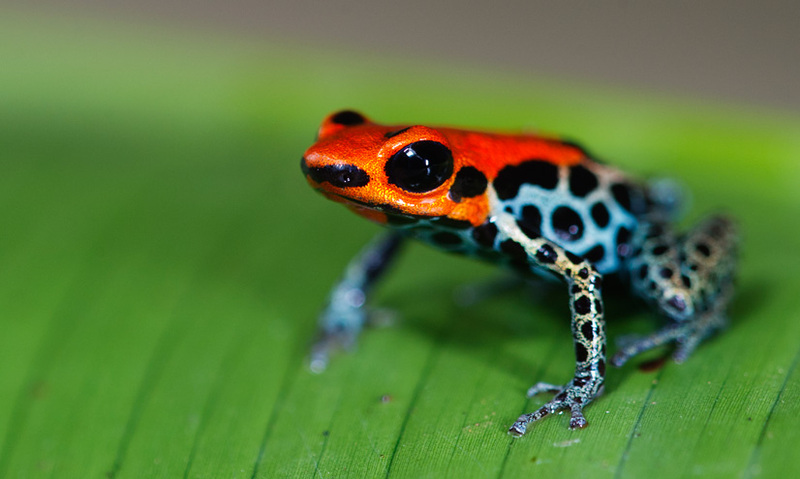 Poison arrow frogs live in the rainforests of central and South America. Like all amphibians, the poison arrow frog needs to lay its eggs in water. On the forest floor, the frogs find moist places such as puddles or exposed tree roots in which to lay their eggs.